"Can you put Post Malone back on?" Amanda Bynes asks in a way that's both confidently decisive and exceedingly polite. She's modeling a pretty beaded and crystal-studded silver top that she designed herself, her long honey blonde hair parted to the side like a '90s cover girl, while posing serenely as the photographer snaps her picture. If you were to ignore the incredibly 2018 musical reference and shut your eyes, you'd be forgiven for thinking you'd walked onto a photo shoot ten years ago. Back then, Bynes regularly graced covers for publications like Vanity Fair, Cosmopolitan or Seventeen while she was promoting films like What a Girl Wants, She's the Man or Hairspray. But it's not 2008 — it's 2018 — and as any fan or casual reader of the Internet knows, a lot has changed, not least of which is that Bynes has spent the last several years retired from acting and avoiding the spotlight. But things are changing again. A day after the shoot, I meet Bynes on campus at Fashion Institute of Design and Merchandising, commonly known as FIDM, in downtown Los Angeles. The 32-year-old has been enrolled there since 2014 and is receiving her Associate's of Art degree in Merchandise Product Development this month before embarking on a Bachelor's degree immediately thereafter in January. She gives me a tour of campus, and as we pass through the grassy quad, we chat about our shared love of Issa Rae's HBO series Insecure; Bynes points out the apartment building that lead character Molly is supposed to live in on the show. We wander around an administrative floor in the main building, pausing to admire vintage Dior sketches and a mannequin wearing one of the designer's iconic late-'40s-era "Bar" suits. A series of artfully chic administrators — the kind you could picture gracing the pages of Ari Seth Cohen's Advanced Style blog or swapping bangles with Iris Apfel — pop out of offices, lighting up when they see Bynes and greeting her with hugs. She smiles when she sees each of them, stopping to chat with a bright-eyed warmth. During our campus visit, Bynes talks about the classes she's taking and her surprise at enjoying her Merchandising Math course. "It's a class on mark-up percentage, mark-up dollar, retail cost and everything about selling your product," she explains. "I never really liked math before, but I like this class." And "I'm getting a 96 in it." Later, when we talk about how Bynes might want to use her FIDM degrees, she quickly expresses interest in designing a full line one day. But, she adds, "I want to get back into acting first." As a child, Bynes had the kind of acting career that any theatrical kid inclined to the spotlight would envy. Growing up the youngest of three children, Bynes started acting in youth plays early on and got an agent when she was 7. Her natural talent and impressive comedic timing quickly booked her a series of commercials — over twenty in a year and half period, she says — for brands like Barbie and Nestlé Crunch. But her big break, as it were, happened when she was attending a children's comedy camp at LA's legendary Laugh Factory and a Nickelodeon producer saw her perform. She spoke to her parents after the show and encouraged them to let their daughter audition for the cable channel. She did and was offered a role on All That, the seminal "SNL-with-tweens"-esque sketch show on Nick that '90s kids continue to look fondly on and that regularly fuels nostalgic Buzzfeed listicles. Like her peers, Bynes had been obsessed with the series before landing a part on it; she even recalls making her mom stay cooped up in a hotel room with her while on vacation so she could catch a marathon. "It was a dream come true," she says of being cast on the show. "It was unbelievable for me." Three years in, Nickelodeon producers told Bynes they wanted to create an entire series centered around her, inspired by The Carol Burnett Show. The result — The Amanda Show — was a hit and cemented Bynes as one of the funniest and most promising performers of her generation. After three seasons, it felt like time to move on, and Bynes began transitioning into films. At 15, she shot Big Fat Liar opposite Malcolm in the Middle star Frankie Muniz before TV came calling again. She was offered another series centered around her, this time for network television and thus more grown-up audiences. The result was What I Like About You on the WB, which had Bynes starring opposite Jennie Garth in an Odd Couple-esque set-up, playing two sisters living in New York City. During this time, Bynes also continued to pursue film projects, shooting What a Girl Wants opposite your mother's crush, Colin Firth, and She's the Man, for which Bynes can fairly be credited with launching Channing Tatum's career. "I totally fought for Channing [to get cast in] that movie because he wasn't famous yet. He'd just done a Mountain Dew commercial and I was like, 'This guy's a star — every girl will love him!' But [the producers] were like, 'He's so much older than all of you!' And I was like, 'It doesn't matter! Trust me!'" But She's the Man, a modern update on Shakespeare's Twelfth Night that saw Bynes play a teen girl dressing in drag to pose as her brother, led to, in Bynes' words, "an interesting experience" after it wrapped. "When the movie came out and I saw it," she says, "I went into a deep depression for 4-6 months because I didn't like how I looked when I was a boy." She paused. "I've never told anyone that." Seeing herself with short hair and sideburns was "a super strange and out-of-body experience. It just really put me into a funk." Fortunately, an exciting, big project was right around the bend: Hairspray, the 2007 remake of John Waters' cult classic. "That movie to this day was the most amazing experience I've ever had on a set," she recalls of getting to sing, dance and act alongside co-stars like John Travolta and Zac Efron. 2007 also saw Bynes star in a Snow White-goes-to-college teen flick, Sydney White. 2007 may well go down as one of the high (or, perhaps, low) points in paparazzi culture, with tabloid print media colliding with the nascent gossip blogosphere to drive up the demand for pap shots of young starlets leaving Hollywood clubs or getting into questionable exploits outside late-night mini-marts. But Bynes managed to stay above the fray. "I never really liked going out that much," she says of those days. "I [only] started going out around 25 years old." She says she didn't really drink much as a teenager and "never liked the taste of alcohol. I could not stomach it." But, she says, "I started smoking marijuana when I was 16. Even though everyone thought I was the 'good girl,' I did smoke marijuana from that point on." She hastens to add, "I didn't get addicted [then] and I wasn't abusing it. And I wasn't going out and partying or making a fool of myself... yet." She says this last part with a self-aware laugh. As time went on, however, her youthful experimentation with marijuana evolved into trying other, harder recreational drugs. "Later on it progressed to doing molly and ecstasy," she says matter-of-factly. "[I tried] cocaine three times but I never got high from cocaine. I never liked it. It was never my drug of choice." One drug she admits she started taking on a regular basis, however, was Adderall. "I definitely abused Adderall," she says. Around the time of Hairspray, she remembers "reading an article in a magazine that [called Adderall] 'the new skinny pill' and they were talking about how women were taking it to stay thin. I was like, 'Well, I have to get my hands on that.'" Like many of her fellow millennials experimenting with the amphetamine in their teenage or college-aged years, Bynes says she was able to get a prescription after going "to a psychiatrist and faking the symptoms of ADD." Looking back, she thinks Adderall played a big role in her behavior on set filming Hall Pass in the spring of 2010, one of the first instances when the public started to get an inkling that something might be amiss with the young actress. "When I was doing Hall Pass, I remember being in the trailer and I used to chew the Adderall tablets because I thought they made me [more] high [that way]," she says. "I remember chewing on a bunch of them and literally being scatterbrained and not being able to focus on my lines or memorize them for that matter." While filming, Bynes says she "remembers seeing my image on the screen and literally tripping out and thinking my arm looked so fat because it was in the foreground or whatever and I remember rushing off set and thinking, Oh my god, I look so bad." "I went into a deep depression for 4-6 months because I didn't like the way I looked as a boy." It was "the mixture of being so high that I couldn't remember my lines and not liking my appearance" that prompted Bynes to pull out of the film — despite reports that later emerged to the contrary alleging she'd been fired. "I made a bunch of mistakes but I wasn't fired. I did leave... it was definitely completely unprofessional of me to walk off and leave them stranded when they'd spent so much money on a set and crew and camera equipment and everything." Things started to spiral from there. A few months after walking away from Hall Pass, Bynes recalls attending a screening of her last film, Easy A, and "having a different reaction than everyone else to the movie." Not unlike her discomfort on the Hall Pass set, she elaborates that "I literally couldn't stand my appearance in that movie and I didn't like my performance. I was absolutely convinced I needed to stop acting after seeing it." She continues, "I was high on marijuana when I saw that but for some reason it really started to affect me. I don't know if it was a drug-induced psychosis or what, but it affected my brain in a different way than it affects other people. It absolutely changed my perception of things." "I saw it and I was convinced that I should never be on camera again and I officially retired on Twitter, which was, you know, also stupid," she says wryly. "If I was going to retire [the right way], I should've done it in a press statement — but I did it on Twitter. Real classy! But, you know, I was high and I was like, 'You know what? I am so over this' so I just did it. But it was really foolish and I see that now. I was young and stupid." After retiring from acting, Bynes found herself feeling adrift, having quit what had been basically, up until this point, a lifelong pursuit. "I just had no purpose in life. I'd been working my whole life and [now] I was doing nothing." She continues, "I had a lot of time on my hands and I would 'wake and bake' and literally be stoned all day long." Around this time, Bynes said she started "hanging out with a seedier crowd and I isolated a lot... I got really into my drug usage and it became a really dark, sad world for me." She sums up her life back then as one in which she "was just stuck at home, getting high, watching TV and tweeting." It's this last activity that perhaps unfortunately causes Bynes the most anguish to think about. While she can look back on her decision to announce her retirement with a tweet with humor and equanimity, there are other, more painful 140-character episodes that are difficult to talk about. She declines to get into specifics about any of the more alarming or hurtful messages she sent about fellow celebrities or family members back then (including that infamously vulgar message about a certain Toronto rapper) but throughout our conversation she expresses deep regret and sorrow about any pain or hurt her behavior may have caused. "I'm really ashamed and embarrassed with the things I said. I can't turn back time but if I could, I would. And I'm so sorry to whoever I hurt and whoever I lied about because it truly eats away at me. It makes me feel so horrible and sick to my stomach and sad," Bynes says. "Everything I worked my whole life to achieve, I kind of ruined it all through Twitter." But, she adds, "it's definitely not Twitter's fault — it's my own fault." "I've been sober for almost four years now," Bynes tells me, crediting her parents with "really helping me get back on track." But as anyone who has gone through substance abuse issues of their own or witnessed a friend or loved one navigate those challenges knows, sobriety isn't exactly easy and credit must be given to Bynes herself. "She wanted to get well," Toni Hohberg, the president and chief executive of FIDM, tells me, attributing Bynes' continued sobriety as a testament, in large part, to this genuine desire to overcome her struggles. "She's tasted the worst of the world and she's come through it beautifully," Hohberg continues. "And I think one of the things she's going to be greatest at now is giving advice, starting with young people in the fifth, sixth, seventh or eighth grades — people who are tempted by [others] around them. "She can talk to anybody about anything and say, 'I've been there and done that and you can [overcome this], too'" Hohberg says. "She could save so many young people today." Bynes already has thoughts and words of advice for people who might see themselves in some of her experiences. "My advice to anyone who is struggling with substance abuse would be to be really careful because drugs can really take a hold of your life," she says "Everybody is different, obviously, but for me, the mixture of marijuana and whatever other drugs and sometimes drinking really messed up my brain. It really made me a completely different person. I actually am a nice person. I would never feel, say or do any of the things that I did and said to the people I hurt on Twitter." She continues, "There are gateway drugs and thankfully I never did heroin or meth or anything like that but certain things that you think are harmless, they may actually affect you in a more harmful way. Be really, really careful because you could lose it all and ruin your entire life like I did." Four years in, Bynes says, "Those days of experimenting [with substances] are long over. I'm not sad about it and I don't miss it because I really feel ashamed of how those substances made me act. When I was off of them, I was completely back to normal and immediately realized what I had done — it was like an alien had literally invaded my body. That is such a strange feeling." 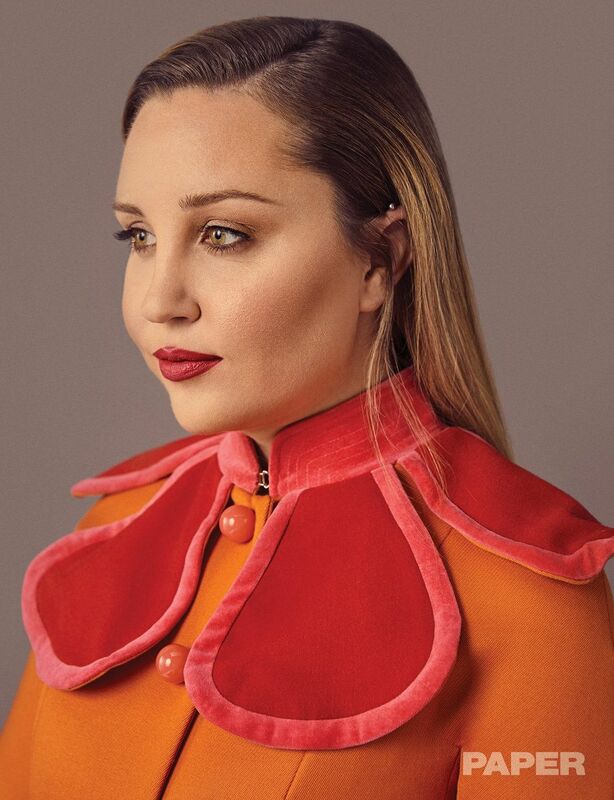 After a harrowing couple of years, Bynes, bolstered by her family and support system, found a new pursuit to fill the hole that acting had left: fashion. (She'd already gotten a taste of the fashion industry after having collaborated on a line, 'dear,' with collegiate apparel brand Steve and Barry's back in 2007.) In 2014 she enrolled in FIDM, after first hearing about it, she says, watching The Hills and seeing the reality show's star, Lauren Conrad, attending classes there. "Instructors love her. Love her," says Kathi Gilbert, the assistant dean of admissions and one of Bynes' advisors. Professors have said they "wished all of their students could be like her," she adds. "She's smart, she participates in class — she's an amazing student." "I know my behavior was strange so people were trying to grasp at straws." She's made some close friends at school although she admits that because of everything she's gone through, she's "more guarded than I ever was" because she still encounters people with preconceived notions about who she is or what happened to her. Whether coming from an acquaintance or the media, these kinds of assumptions grate on Bynes. While over the last few years the Internet and social media have become much more empathetic to stars navigating substance abuse issues or mental health challenges, the Internet of even five years ago was a lot snarkier and a lot more speculative. "It definitely isn't fun when people diagnose you with what they think you are," Bynes says, in reference to countless headlines over the years that attempted to put a psychological label to her behavior. "That was always really bothersome to me. If you deny anything and tell them what it actually is, they don't believe you. Truly, for me, [my behavior] was drug-induced, and whenever I got off of [drugs], I was always back to normal." "I know that my behavior was so strange that people were just trying to grasp at straws for what was wrong," Bynes concedes with clear-eyed analysis and remarkable consideration for these wannabe "armchair psychiatrists." Maybe above all, it's this trait — consideration — and its related cousin, empathy, that Bynes rues having once lost but, now more than ever, it's clear that she's found. Throughout the course of the photo shoot, to which she arrives early, Bynes checks in with various members of the production team frequently, looking to ensure everyone is getting exactly what they need out of the endeavor. She gamely sticks around past midnight to add another shot after the crew decides it would be a good idea to have one more look added into the mix. She compliments someone's red pants and delights in an adorable photo of her friend's two-year-old daughter. Sometimes society confuses agreeableness or niceness with blandness or, even worse, weakness — especially when it's a trait exhibited by a young woman — but make no mistake: Bynes is neither bland nor weak. She's a woman who still possesses that same expressive sense of humor that first won over producers for All That as well as a type of thoughtfulness and self-awareness that comes with age — and gets amplified when you've had to navigate some dark waters. "I have no fear of the future. I've been through the worst and came out the other end and survived it so I just feel like it's only up from here." When talking about her plans to return to acting, Bynes says she wants to re-enter the business "kind of the same way I did as a kid, which is with excitement and hope for the best." She says she wants to have the chance to "try it all" and "doesn't want to limit myself" by only gunning for certain types of roles or productions. As a SoCal kid, Bynes says her favorite brand growing up was the skatewear line No Fear, and she describes being drawn back then to the notions of bravery and fearlessness. "I think that's kind of how I go about [life] now — like, what's there to lose? I have no fear of the future. I've been through the worst and came out the other end and survived it so I just feel like it's only up from here."